1. From the home page, click on the JOIN US button. 2. 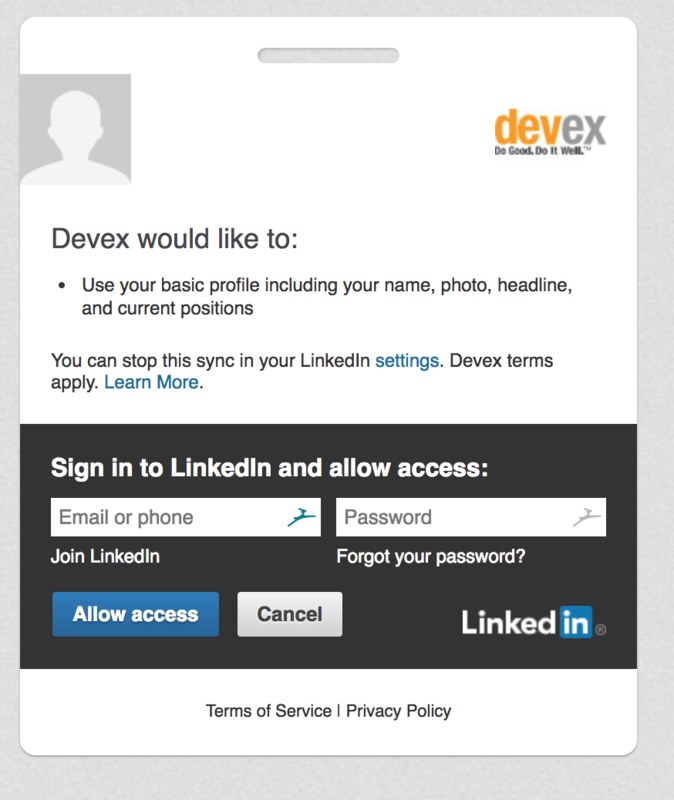 You now have the option to sign up either by using an existing Linkedin account (allowing Devex to import your Linkedin data), or by filling out the default sign up form. 2. Type in the phone number/e-mail address and password, associated to your Linked in account and click on the Allow access button after which, you will be directed to the Devex homepage right away. 2.B. Using the default sign up form. 1. Complete all the required fields and click on Next. 2. Click on Add to my profile after providing your Professional details on the next page, but you have the option to skip this by clicking on the Not now hyperlink. An e-mail will then be sent to you after your account has been created. * Opting to sign up using your Linkedin account means a one-time migration of data from your Linkedin profile.